Get the most beautiful and durable landing net for yourself or as a gift! 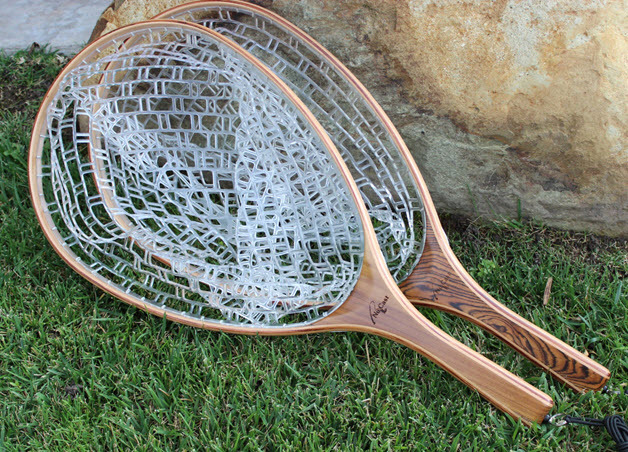 A beautifully handcrafted fly fishing net for all around use. With a U.V. resistant marine grade finish making it both waterproof and durable. The clear PVC bag (ghost) will disappear in the water and not spook fish. The rubber net is catch & release friendly as fish & flies are less likely to get tangled in the bag. Each net comes standard with a ring archor and cord. Lightweight making it easy to land the big one. Your choice of Hawaii Koa or Dalbergia fine wood grains. Each net has its own individual wood pattern.